FoodNet is the principal foodborne disease component of the CDC’s Emerging Infections Program (EIP). The project consists of active surveillance for foodborne diseases and related epidemiologic studies at over 650 clinical laboratories in ten states: California, Colorado, Connecticut, Georgia, Maryland, Minnesota, New Mexico, New York, Oregon and Tennessee. Designed to help public health officials better understand the epidemiology of foodborne diseases in the U.S., FoodNet is a collaborative project of the CDC, ten state health departments, the Food Safety and Inspection Service of the U.S. Department of Agriculture (USDA), and the Food and Drug Administration (FDA). Food Safety is one of the 42 topic areas in Healthy People 2020, a set of goals and objectives with 10-year targets designed to guide national health promotion and disease prevention efforts to improve the health of all people in the United States. To make it easier for the public to know what FDA is doing and become involved through public hearings, earlier this month the agency redesigned its web page dedicated to the FDA Food Safety Modernization Act (FSMA). The updated FDA web page Recalls, Market Withdrawals & Safety Alerts makes it easier for consumers to use with search results providing data from news releases and other recall announcements in a tabular format. Covering recalls of food, drugs, products affecting animal health, biologics and medical devices, the table organizes information from news releases on recalls since 2009 by date, product brand name, product description, reason for the recall and the recalling company. It also provides a link to the news release on each recall for more detailed information. Recalls, mandatory or otherwise, are serious and we must do everything possible to make it easier for people to know about these recalls so they can take all appropriate steps to protect themselves and their families. We know that success depends heavily on bringing our stakeholders into the effort. We are working hard to keep them informed and to get their input throughout the process. 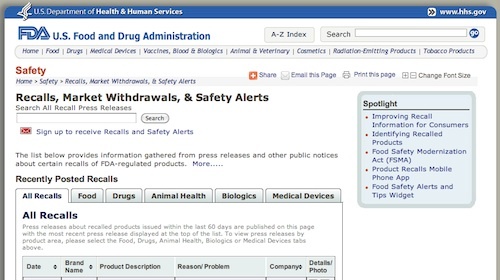 The FDA Recalls, Market Withdrawals & Saftey Alerts page also provides addtional resources with expanded information about major product withdrawals, pages that list biologics and medical device recalls, and a page that provides guidance and instructions to FDA regulated companies. For more on the new food safety tool, New Public Health, a community forum from the Robert Wood Johsnson Foundation, has a Q&A with FDA food saftey spokesman Douglas Karas about the site. Redesigned FDA Web Page Fosters Food-Safety Awareness. U.S. Food and Drug Administration. 2011 Apr 18.